This entry was posted on Monday, June 28th, 2010 at 9:20 pm and is filed under Concurrency, Java, Performance, Software Transactional Memory. You can follow any responses to this entry through the RSS 2.0 feed. You can leave a response, or trackback from your own site. Interesting topic. The shape of your graph is … unlikely, though. I find it difficult very difficult to believe that smooth but irregular sine wave pattern is actually possible! Can you indicate the actual data points? And also provide the code you used? We may be able to analyze the results further. The pretty sinus was created by configuring some line smoothing in gnuplut. I’ll create a new diagram (combining both) that uses straight lines between the points. I’m not going to release the code yet, will only be done after the 0.6 release. Line smoothing is useless for this diagram. 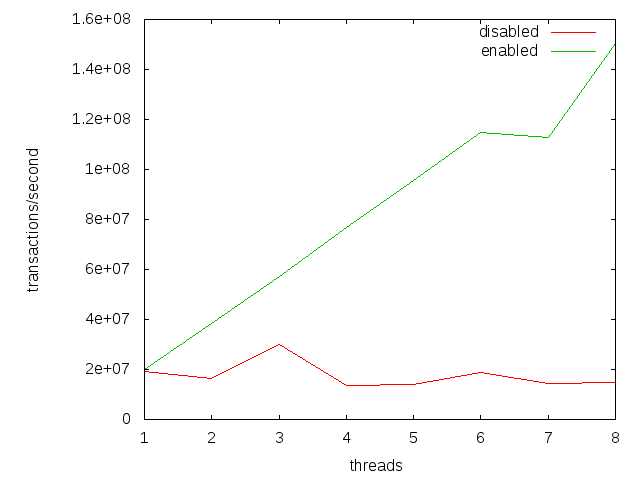 Your X-axis dimension is the number of threads. It is a discrete set of values. You cannot have 2.4 threads for instance. You have 2 or 3. A bar chart would be a more appropriate way to visualize it. Hello Peter. Thanks for the new diagram. That is an impressive difference. The dip at the seventh test looks like an out-lier. I wonder if it reproducible. The JIT sometimes chooses to equal executions optimize differently, whereby “equal execution” I mean the same code doing the same things with the same data. I recall that a study found that one in five start-ups of a JVM would produce sub-optimal JIT’ing of their benchmarks. 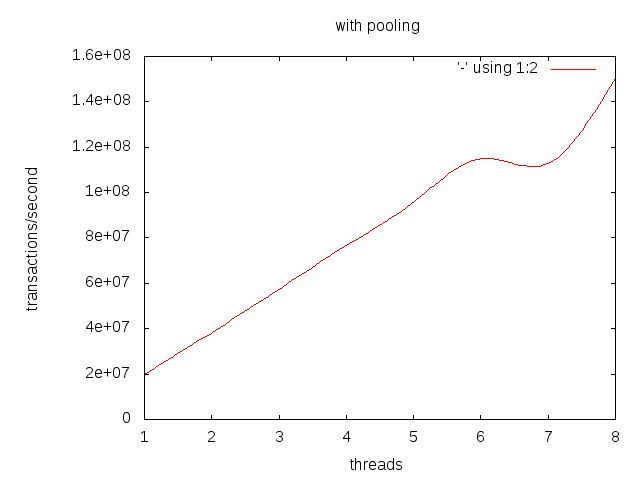 It would be interesting to see the actual pool sizes of the threads during execution. Can you please point me to the object pool package in your source? 1. 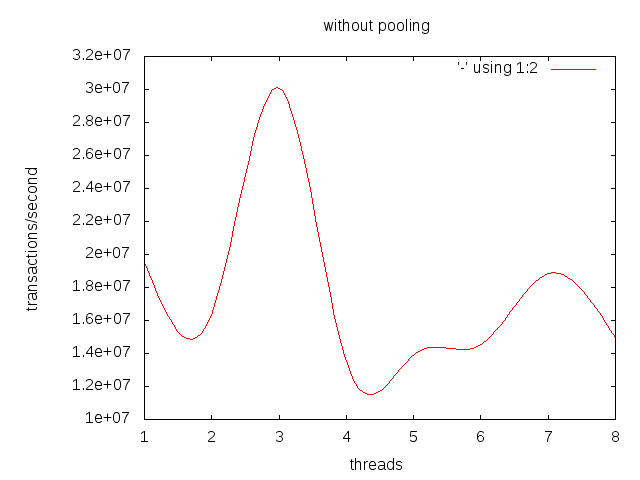 What is the behavior of the pool if a user requires more objects than the max pool size? 2. If the pool size grows, does it shrink also? What is the algo for pool shirking.